The Trojan War was waged, according to legend, against the city of Troy by the armies of the Achaeans (Mycenaean Greeks), after Paris of Troy stole Helen from her husband Menelaus, King of Sparta. Agamemnon, King of Mycenae and Menelaus’ brother, led an expedition of Greek troops to Troy and besieged the city for ten years. After the deaths of many heroes, the city fell to the ruse of the Trojan Horse. The Iliad relates a part of the last year of the siege of Troy. Ancient Greeks believed that the Trojan War was a historical event, and Eratosthenes dated it to 1194–1184 BC. Nine years into the war, Agamemnon dishonors Achilles by seizing a slave woman given to him, and Achilles withdraws from the fighting in anger. Both armies gather in full for the first time since the landing but, without Achilles, the Greeks are being finally defeated. However, the Trojan prince Hector kills Patroclus and, to his regret, brings Achilles back to the war forrevenge. Achilles is reconciled with Agamemnon, who has been having a hard time holding the Greek Coalition together for so long. It is now or never. This scenario takes place right after the death of Patroclus and is about how the siege of Troy could have ended, inspired bythe Iliad. Gods will not join the battle, just Heroes and men. The Greeks have Achilles and his Myrmidons, plus a 4th leader, Agamemnon, though they’ll get into trouble if they lose the Coalition Commander against a Trojan Hero. The Trojans should not wait inside Troy, their forces outside are too weak to face the Greeks, and may compensate the extra Greek leader by using their horses to move leaders accross the field. May the Gods be with you! Hero-Hero Combat: make Leader casualty checks only in Close Combat against units with an attached Leader. For each Leader killed discard 1 Command Card (2 CC if Agamemnon). Walls: to move into Troy or the Greek Camp, an enemy unit must be in an adjacent hex. The rampart tile on the left(right) provides additional protection along the left(right) side. 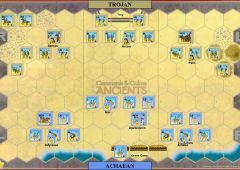 Achilles (use Alexander block ): the unit with Achilles, swift o oot, battles with 1 additional dice in Close Combat and may move 2 hexes and battle. Myrmidons: they are a Special Unit. They will ignore 1 sword symbol and may ignore 1 ag.